A more romantic and less fun take on His Girl Friday, this movie definitely has decent humor, but the storyline is a little too routine. A decent comedy, this film tells the story of a couple that is getting divorced, and how they both start seeing other oeople. Only there’s a problem. They both still have feelings for each other, and so they spend the lenth of the movie trying to destoy the other ones nrew relationship. All of that sounds like fun, and it is for a little while, but by the second half, the movie is basically on repeat. Now the character who is in the relationhp changes, and so does the character who is trying to destroy it. So the movie definitely could have been trighter and less predictable there, but it was still kind of interesting and different. 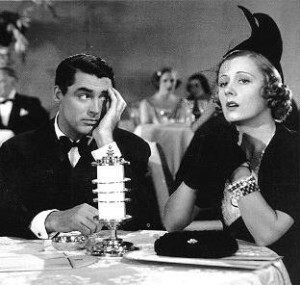 The Awful Truth is one of the first known Cary Grant movies and a fairly witty comedy. It’s a movie with a premise about divorce, where a couple separates and each member finds a new partner while simultaneously trying to sabotage the other’s relationship. There’s definitely a fun premise here, and it’s actually a shame that the movie didn’t take it even further. I suppose that’s just a product of the time period this film was made in. The movie is definitely ripe for a remake, and one that would probably be even better than the original. In fact, Cary Grant starred in a movie, just three years later, that in many ways felt like a spruced up version of this film. That movie was called His Girl Friday. 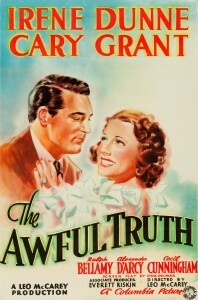 The Awful Truth is the movie that laid the groundwork for a masterpiece like that movie to be made. The main connection between the two films is that Cary Grant is a fast talking swindler who is still in love his ex. His ex, meanwhile, is seeing another guy. And Grant is on a mission to sabotage that relationship and win the woman back. He does this by playing on what he knows about her, and her love of chasing down a story. Here, in The Awful Truth, there’s something very similar going on as Cary Grant’s character, Jerry Wariner, and his wife, Lucy Warriner, are separated, and he tries to get in the way of her new relationship. When the movie starts, Jerry is just getting home from a trip. He told everyone that he was going to be in California for a period of time, but really, he was in Florida with another woman. We get all of this from the opening scene, where Jerry is talking to a friend and the friend calls him out on his lie. Then Jerry goes into his house, where there are a number of guests hanging around in the living room. His wife arrives with a man who has been giving her singing lessons, and Jerry is suspicious that this man and his wife have been up to a little more than that. For the entire duration of the scene, Jerry walks around the room making back-handed insults at this man and trying to get him to leave. Lucy, meanwhile, just laughs all of these comments off, hoping she doesn’t reveal something to Jerry, considering how suspicious he already is. By the end of the scene, Jerry is flat out accusing Lucy of cheating on him, and Lucy is ready to crumble when she spots an orange that Jerry brought home from his trip and notices that it says Florida on it. So they have both been lying to each other and cheating on the other, and now they both are aware of it. This is a great ending to the opening sequence. The result of it all is that the two of them decide to get divorced. Not long after that, Jerry starts seeing a man named Daniel (Ralph Bellamy,) who lives in her building. Daniel seems like a sweet and caring guy, and he is very much like the character in His Girl Friday who is the nice guy that loses to our hero, the ambitious, play dirty, fun character. Here, Daniel lives with his mother, and spends a good deal of time inside of Jerry’s apartment. Unfortunately, so does Jerry. He has visitation rights with the dog that he and Lucy shared, and Jerry takes full advantage of them to be around the apartment as often as he can. There’s are a couple of scenes where Jerry comes over and stays in the same room as Daniel and Lucy, making a good deal of noise while they are talking. And one point its him on the floor, playing with the dog, getting him all riled up. At another, it’s him on the piano, playing a loud and abnoxious song. Daniel, of course, is the naive character, somehow not realizing what Jerry is trying to do and just thinking that Jerry is unaware of how loud he is being. Jerry is very aware. And so is Lucy, who takes Daniel away and decides to go out with him, instead of staying around and listening to Jerry make noise any longer. The shenanigans with Jerry trying to interfere with the relationship between Daniel and Lucy continue, (although Daniel’s mother doesn’t help, with her offensive comment about their divorce.) The final straw comes when Lucy has both her singing teacher, (the man who she was having an affair with at the start of the film,) and also Jerry, hiding in the bedroom, while she entertains Daniels sudden pop-in visit at the door. Jerry and the the singing teacher go at it, getting into a fight, and we hear tons of loud noises happening off screen. Then the two of them go running out of the room and through the apartment. This is it for Daniel. The girl he’s seeing was keeping not one, but two men, hidden in a bedroom. That’s it. At this point, the movie goes through an unusual change. It’s now the midpoint of the film, and suddenly Jerry starts seeing a woman. His getting together with this woman is done incredibly quickly, in a montage. It’s definitely too fast. But the movie wants to focus its energy on the relationship between Jerry and Lucy, and not anyone else. What’s interesting is that for the second half of the film, the roles are reversed and now it is Lucy trying to sabotage Jerry’s new relationship. This definitely seems out of character for Lucy, who has been pretty timid so far, but she has fun with it, starting from when she answers the phone at Jerry’s play when he new girl calls, and gets the woman suspicious. Jerry covers it up by saying it was his sister on the phone, and the next thing he knows, his sister is being invited to the new girlfriend’s house to have dinner with her family. Lucy takes full advantage of this opportunity to get carried away. For everything going on here, the movie is actually very simple. Both characters are still in love with each other, and they each spend half the movie trying to sabotage the others new relationship. In the first half, it’s Jerry trying to ruin Lucy’s new prospect and in the second half, it’s Lucy doing the saem thing to Jerry. Now, I prefer this idea then just watching one character on the same mission for the entire film, but the problem is, with this movie it just doesn’t quite feel like enough. There needs to be some originality and creativity, and the movie starts with that kind of energy, (having both characters cheating on each other,) but soon becomes very predictable. The fast talking characters are a lot of fun, but they were certainly done better in His Girl Friday. The Awful Truth does have some laughs and a likaeble premise, but it also could have been a whole lot better.